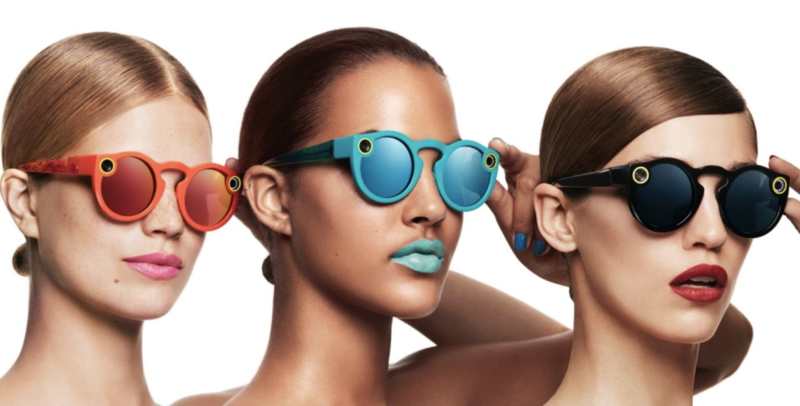 Released November 2016, Spectacles were the birth of Snap Inc. as “a camera company” and their first foray into hardware. The sunglass/camera are integrated with Snapchat. Press the button and the camera records a 10 second clip. Press the button again while recording to record up to 30 seconds. Via bluetooth the videos are imported into Snapchat and you can add filters, text or other content before sharing. Connect via wifi from your phone and download the “HD” version of the videos and save them for later. From pressing record to sharing on Snapchat you can do it in about a minute. For the first 4 months the $130 sunglasses were only available at ‘Snapbot’ vending machines. I ordered a pair of as soon as they were available to purchase online. I went with the classic black instead of the bright Coral or Blue. Spectacles yellow rings around the camera and LEDs give them a distinct look. They are a conversation piece and draw lots of questions. You be the judge of how they look on my face. I usually buy and wear weird sunglasses so Spectacles are par for the course. 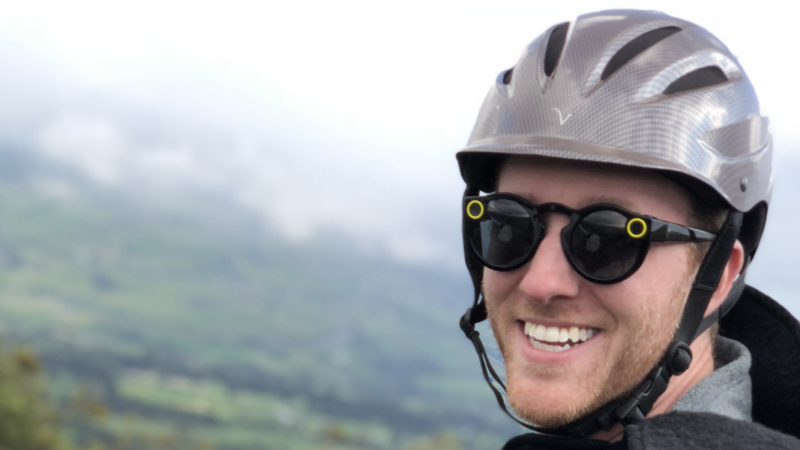 Snapchat Spectacles on my face – good? bad? Case – The ‘Snapchat yellow’ case doubles as a charger and keeps Spectacles protected and charged. The case allows 4 full charges and fit into a water bottle pocket of a backpack or standard cupholder. My main issue is that the charge cable is proprietary instead of standard USB port. Camera – The camera has a 115-degree-angle lens, wider than smartphone’s and similar to the eyes’ field of view. The video recorded is circular at 752×752 standard resolution and 1152×1152 for HD. When exported to the camera roll there is whitespace outside of the frame. Viewed in Snapchat you see “Full Circle” and rotate the phone to see all the detail. Or, pinch zoom out and see everything. The video looks best with natural light outdoors, which is fitting that they are sunglasses so you don’t record inside and, 1. look like an idiot with sunglasses on inside. 2. have a grainy dark video. Microphone – the microphone is on the right side, same as camera, so sound for videos is louder for objects on the right, quiet for the left. Overall the microphone does a good job at capturing voices and music well. Durability – For normal daily use Spectacles were fine. I was a aggressive with my usage and my pair had a issues. After 60+ miles of hikes in Canada one joint screw fell out. I had single sided glasses until I bought a glasses repair kit. I also was not good at keeping my Spectacles out of high humidity and moisture. The lens had moisture and eventually the pair was not able to pair with Snapchat and were unusable. The team at Snap Inc. did do a good job of helping me troubleshoot and were responsive at sending me a new pair. 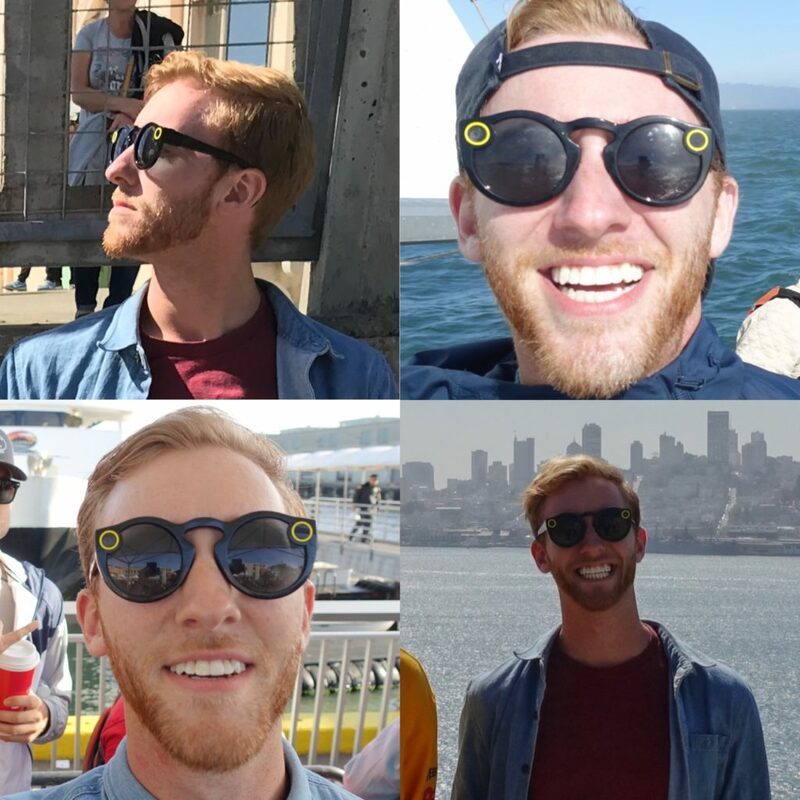 Over the last 12 months of Snapchat updates Snapchat updated dozens of times and there have been improvements with Spectacles functionality. Initially the transfer from glasses to phone took 25+ seconds per video, now this is down to less than 10 and usually happens behind the scenes. Once you open Snapchat the videos are imported and ready to be shared. Within Snapchat ‘Memories’ section there used to be a dedicated section to Spectacles videos but that was removed and now all saved snaps are under one tab. Now there is no way to only review only Spectacles footage now which is a bit annoying. My first opportunity to create was a wedding weekend in Nashville. The best videos were from the dance floor. Looking back on the footage now It is fun to relive a night where I might of had a few too many drinks through Spectacles videos. 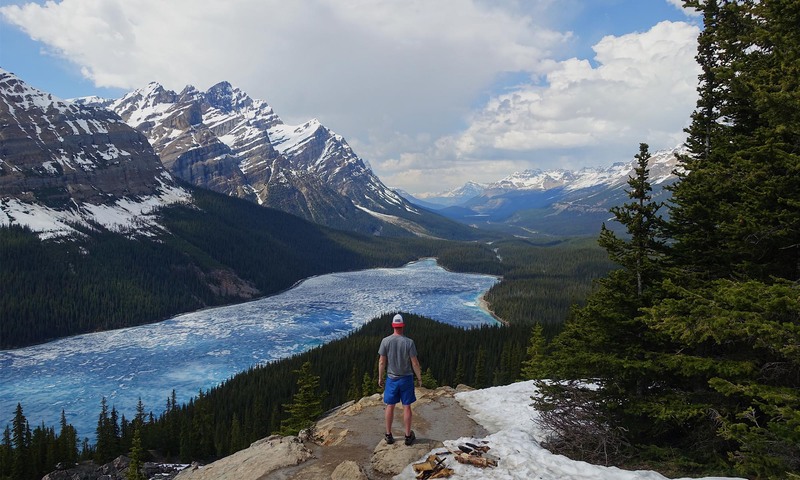 Exploring spectacular Banff, Canada was the perfect opportunity to use Spectacles in nature. I hid my phone in my bag all day and only worried about enjoying the sights. Over 6 days and numerous hikes I captured the beauty of the hikes and sights. For move videos check out this twitter moment with 7 Spectacles videos of the beautiful sights of Banff, Canada. Another fun use of Spectacles’ first person perspective is telling a short story. On mothers I needed to pick up flowers for my mom. Using a combination of Bitmojis and Mothers Day filters and text I made a fun story. I liked how creators used Spectacles footage and video editing software to create a story. One of my favorites by Karen Cheng documents her trip to Japan. On my vacation to Colombia I used videos like Karen’s to inspire what I created. I recorded our adventures and put together highlight video. Using my iPhone and the ‘Clips’ app the edit took about 3 hours and I am happy with what I created. From the Snap Inc. website, their mission statement (emphasis mine). Spectacles are the physical representation of ‘live in the moment’. Spectacles help achieve that. I found value in experiencing events without a camera or phone in hand. $129 worth? I say yes. In 2018 stories are everywhere and there is an abundance of stickers, filters, fonts, special effects and AR to spice up stories. Spectacles offer a unique way to share a first person perspective and share the experience instantly. With reports of over 150,000 unit sales and addition of sales in Amazon and retailers I don’t think they have given up yet. As of February 2018 they are still hiring for the spectacles team. I believe in Snap’s mission statement to empower people to live in the moment. I hope they continue to pursue this mission, using what they learned from Spectacles to develop tech to help everyone live in the moment and not behind screens. A 2018 goal of mine is to create more. Video is one avenue I want to pursue. The iPhone + Spectacles combination allows me to capture action as it happens. I like that I don’t need to be in front of the camera to tell the story. I can stay in the producer/director/cinematographer seat and let the sights be the story. For more be sure to follow me on Snapchat! Spectacles at sporting events. it is impossible to catch the action happening on the field but it is a great way to capture the crowd reaction. Below, example of video exported and shared with the whitespace. Video at night and audio of both crowd noise and fireworks. More in nature. Spectacles at Muir Woods National Forest. Videos edited with Spectacles footage in the ‘Clips’ iPhone app.